SKU: sian-kaan-jeep-safari-tour. Categories: Affordable Eco Tours In Cancun. 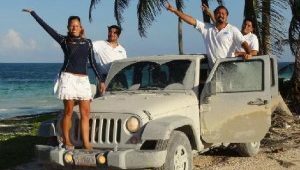 Drive your own Jeep to Punta Allen in the Sian Ka’an Biosphere Reserve Jeep Safari Tour. Allow yourself to be delighted by this extraordinary day filled with activities, and by the remarkable landscapes that have been Patrimony of Humanity for years. The Sian Kaan Biosphere Reserve is an amazing refuge with a wide biological diversity. During your visit to this beautiful place you can witness a magical scenario where you can enjoy the wonders of Mother Nature at her finest. Appreciate the flowers and wildlife in their natural habitat. We start out this adventure with pick up, which will be at the lobby of your hotel in Cancun or The Riviera Maya. You will then be taken to Tulum, our meeting point. This is where you start your Sian Kaan Jeep Safari Tour. You will be given directions to follow the group; there will always be one professional and experienced guide leading the way in the first Jeep. There will also be one guide in the middle and another one in the last Jeep of the tour, always making sure and taking great measures so that your tour is not only fun, but also safe. 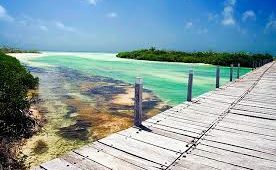 Your first stop is Boca Paila, a world famous fishing lodge with shallow waters in the Mexican Caribbean. Take in some of the most spectacular ocean views, create memories, take photos, and most importantly, enjoy the one-of-a-kind landscape that can only be found in the Mexican Caribbean. 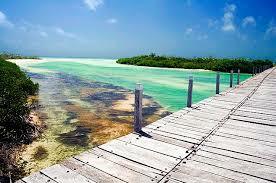 Get back behind the wheel, and caravan to a Fisherman’s Village called Punta Allen for refreshments and snacks. Then, board the boat to start cruising on the stunning Caribbean Sea. During this sail, we will make a couple of stops to observe typical flowers and wildlife native to the area, like dolphins, sea turtles, birds and some others, while navigating among breathtaking and eco-protected mangroves. Our guides are more than happy to explain all the sights you will be taking in, and to answer any questions that may arise. Remember that you will be snorkeling in an incredible untouched Coral Reef. Be wowed by the spectacular natural swimming pool called Blanquizal where adventure never stops. Throughout the tour you will have many picture perfect opportunities to record your memories on film. Back at Punta Allen you will have the opportunity to enjoy different types of mouthwatering meals specially prepared by our Mexican Chefs. After lunch we will continue our Sain Kaan Jeep Safari Tour and we will drive back to Tulum, and get you back to your hotel. Mandatory $30 Mexican Pesos for entrance to Biosphere Reserve of Sian Ka’an.